As long-time readers of this blog know, I’m a big fan of Scott E. Page’s work. Some time back I devoted two posts, imaginatively labeled part 1 and part 2, to The Difference: How the Power of Diversity Creates Better Groups, Firms, Schools, and Society. Page is back with a new book, Diversity and Complexity (Princeton University Press, 2011), that has a more sweeping task even though it is styled as a primer: to elucidate the role of diversity in complex adaptive systems ranging from biological to social (including financial) systems. As the author writes, “A negative feedback exists when increases in the propensity of an action decrease the benefits from taking that action.” Take the case of 1000 people going to the beach on Saturday. They have a common threshold, let’s say 400, where they all say that the beach is too crowded and they’re not going the following week. If 300 people go to the beach on the first Saturday, all 1000 will go the next Saturday. Oops, too crowded, so no one goes the next week, everyone goes the following week, and the yo-yo effect continues. With positive feedbacks, by contrast, “variation in thresholds leads to an increase in the probability of large events.” Imagine a crowd milling around during a time of social upheaval, with each individual trying to decide whether to riot. “By comparing two scenarios,” Page writes, “I can show how variation leads to big events. In the first, each of one thousand people has a threshold of twenty. Any person who sees at least twenty people rioting will join the riot. The result of this distribution of thresholds will be that no riot occurs. In the second scenario, assume that ten people have threshold zero, ten people have threshold ten, ten have threshold twenty, ten have threshold thirty, and so on. This crowd of people is not nearly as angry as the first crowd. Their average threshold is approximately five hundred. And yet, in this scenario, a riot erupts. This is because, initially, ten people riot (those with threshold zero), and then ten more do, and so on, and so on. The variation in thresholds allows the system to tip.” (p. 162) And, Page continues, makes riots (and, I would add, financial outliers) notoriously difficult to time. My quant skills aren’t up to reviewing this book, but I thought I should bring it to the attention of my more math-savvy readers. The core of the book is an analysis of discrete option pricing models with volatility clustering. Mark Leibovit believes that volume analysis is “the closest thing we have to a real working ‘crystal ball’” in the markets. (pp. 425-26) In The Trader’s Book of Volume: The Definitive Guide to Volume Trading (McGraw-Hill, 2011) he outlines the fundamentals of volume analysis and introduces the reader to a broad range of volume indicators and oscillators. In analyzing the relationships between price and volume under various market regimes Leibovit pays particular attention to divergences where volume doesn’t confirm price action and signals a possible trend change. But he doesn’t rely solely on easy-to-spot divergences. He also introduces the reader to volume overlays, including moving averages, MACD, and linear regression. These overlays can help the trader see volume trends over a longer time frame. And, of course, there is the plethora of indicators and oscillators, some 33 in all. Thirteen apply to the broad market; the rest can be used in the analysis of individual securities. In each case Leibovit explains the indicator’s or oscillator’s formulation, its use in trend confirmation, its potential divergence with price, and its use with other indicators. He also illustrates its practicality with a sample trade setup and entry. He closes each section with trader tips. Throughout the book the author stresses that there is no “one size fits all” solution to selecting the appropriate volume indicators and oscillators. Volume analysis is an art, not a science. It depends on the instrument being traded as well as the trader’s time frame. But The Trader’s Book of Volume goes a long way toward taking the mystery out of volume analysis. In roughly 450 pages, amply illustrated with MetaStock charts, it offers concrete ways to use volume to improve trading results. For the options spread trader, especially the non-directional trader, who is looking for strategies and trade management ideas No-Hype Options Trading: Myths, Realities, and Strategies that Really Work by Kerry W. Given, aka Dr. Duke (Wiley, 2011) might be just the ticket. The book (for those who care about the sometimes dueling camps in the options world) reflects some of the techniques taught by Dan Sheridan, who was one of the author’s mentors. Options trading can be daunting, in large measure because “the risk-adjusted return of any options strategy will tend toward zero over time.” (p. 16) It doesn’t matter whether a person engages in high-probability or low-probability trading, whether the spread of choice is an iron condor or an out-of-the-money vertical spread. Without robust risk management the options trader will over time end up with a huge goose egg in his account for all his efforts. The author focuses on calendars, double diagonals, butterflies, and condors. His analyses don’t follow a standard pattern, but generally speaking he discusses trade structures, the rationale for various positions, and ways to enter and manage trades, including adjustments. At the conclusion of each chapter is a set of exercises to test the reader’s understanding of the material. Answers are provided at the end of the book. Here I’ll sample his chapter on butterflies. The first important distinction is between at-the-money and out-of-the-money butterflies. An ATM butterfly, especially on a broad market index, is “a delta-neutral income generation trade.” An OTM butterfly is normally a speculative directional trade; it is an inexpensive, low-probability, high-risk trade. But an OTM butterfly can also be used as a “what if I’m wrong” trade. Let’s say the trader expects a stock to trade higher and has opened an appropriate bull call spread. But, in case the stock doesn’t trade as expected, an OTM put butterfly below the stock’s current price can serve as an inexpensive hedge. Corey Rosenbloom’s The Complete Trading Course: Price Patterns, Strategies, Setups, and Execution Tactics (Wiley, 2011) is an excellent introduction for the beginning trader. Unfortunately it has little to offer the more advanced trader that isn’t readily available elsewhere. But as a Trading 101 course, it succeeds in synthesizing a great deal of material into a coherent, easy-to-follow text. We read about foundational principles (trend, momentum, price contraction and expansion), strategies and tools (candlestick charts, price patterns, Fibonacci tools, Elliott wave theory), and finally execution and trade setups (including two that the author developed). For those who want more, there’s an extensive bibliography. And, of course, the author’s popular blog Afraid to Trade. The Complete Trading Course provides a solid foundation for the aspiring trader. It covers not only basic techniques of technical analysis and position management but also issues of matching trading style to personality. Those new to trading would do well to read it. Last week Steve Ward was the guest presenter in Linda Raschke’s winter lecture series. The webinar is archived on the home page of the LBR Group site. Ward, a performance coach to both athletes and traders, is the author of High Performance Trading: 35 Practical Strategies and Techniques to Enhance Your Trading Psychology and Performance (Harriman House, 2009). The strategies and techniques are sorted into three categories: (1) planning and preparing for trading success, (2) decision-making, discipline and flawless execution, and (3) evaluation, analysis and improving and sustaining performance. Throughout the book Ward asks the reader to answer questions and perform exercises. A couple of examples: Can I raise my performance by focusing on and utilizing my strengths more effectively? Can I raise my performance level by developing my weaknesses? Or, Which feelings detract from your trading performance? How often do you experience these emotions? How do you deal with them? Ward’s book is not revolutionary, but that’s okay. Traders don’t need to make revolutionary changes to improve their performance. A behavioral change here and there, freeing up a frozen mindset, keeping things in perspective. All can help. Those traders who don’t have the luxury of a professional performance coach can still profit from second-best: informed self-coaching. Ward’s book (along with others such as Brett Steenbarger’s The Daily Trading Coach) is an inexpensive way for traders to learn to coach themselves to better performance. Watson: a death knell for discretionary traders? Watson was a resounding success. I wouldn't want to trade against "him" or his money machine successors. I suspect we ain't seen nothing yet. Here's a link to The Economist's take. Each chart type has a “best use” in trading. The price break chart is best at detecting the beginning of a trend, projecting reversal points, and confirming cycle turning points. The Renko chart detects “micro changes in sentiment and momentum.” The point and figure chart shows support and resistance lines, projects breakout ranges, and balances bulls and bears. And the Kagi chart is good at timing the turnover of sentiment. (p. 7) Let’s look very briefly at the first two types of charts here. Cofnas explains how to understand the strength of price movement using price break charts and describes trading strategies (focusing on entries). He also looks at combining cycle analysis with price break charts, describes multiple market applications of price break charts, and explores the use of price break charts in option trading. There is a lot of material in this book, some designed for traders, some for programmers, and some not signaled in the title (cycle analysis and text mining, for instance). The book would undoubtedly have flowed better if its scope had been a bit narrower, but the tradeoff is that Cofnas touches on many ideas that are not currently mainstream. I suspect that most traders could profit from reading Sentiment Indicators. Like Crossley’s bird ID book, it offers the trader a multiplicity of perspectives from which to identify a good trade. I am not a birder. Oh, I can identify the common birds that frequent my habitat. I also have a decent pair of binoculars that I whip out when I’m trying to decide whether the animal lolling about in the yard is just an ugly dog or a coyote. Or when a great blue heron wades at the edge of the pond. But that’s about it. So I didn’t request a review copy of The Crossley ID Guide: Eastern Birds (Princeton University Press, 2011) to improve my birding skills. Of course, who knows? The book is so lush and the identification technique so compelling that I may just be sucked in. I can, however, say unequivocally that for anyone who is a birder in North America, since many of these birds are found across the continent, I can’t imagine being without Crossley’s book and its more than 10,000 images. The price is certainly right: at 544 pages and $21 on Amazon that works out to less than four cents a page. All right, so what did I think my readers could learn from Crossley’s book and from his method of identifying birds? In what ways is identifying a bird similar to identifying a good trading opportunity? Crossley’s plates represent a task unfulfilled for traders. In a typical plate devoted to a single species, Crossley includes photos of male and female birds, juveniles, all or most plumages (breeding, nonbreeding, molting), and birds in flight. These images are anchored in the bird’s most common habitat and exhibit some of its typical behaviors. One rationale for the staggering amount of information in each plate is that “it’s much easier for the human brain to absorb information from a single image than from many separate images.” (p. 23) Traders unfortunately still have to process many separate images, even if they’re on the same computer screen. The notion of context (which Crossley describes as probability) is important in birding as well as in trading. The questions in birding are whether the bird “usually or always occur[s] in this location and in this habitat.” (p. 26) If, for instance, we substitute “pattern” for “bird,” the same questions are applicable, and these are questions that many traders fail to ask. Then we have the problem of the same but different, for instance a juvenile as opposed to an adult of the same species. Think of the juvenile as an early, sometimes a premature entry. The juvenile can be harder to identify; the distinctive characteristics of the adult are often missing. On occasion traders who manage to identify the juvenile can get a better entry point. At other times they simply jump the gun: even a winning trade will have farther to go and the entry won’t win a beauty contest. And then consider the near vs. the far or the stationary vs. the in-flight, all represented in a single Crossley plate. Although I jotted down several more comparisons, I think I’ll wrap up this post. And go back to looking at some more gorgeous photographic composites. This book is a truly amazing accomplishment! Option Spread Trading: A Comprehensive Guide to Strategies and Tactics by Russell Rhoads (Wiley, 2011) is a straightforward book. After covering option basics and spreads using an underlying security, it describes in some detail the standard option-only spreads: straddles, strangles, verticals, butterflies, condors, ratios, backspreads, calendars, and diagonals. Since each chapter is laid out in a similar fashion I can give a sense of the book by focusing on a single option spread. I have chosen the butterfly in its simplest manifestations: long call, long put, iron, short call, short put, and reverse iron. In each case Rhoads provides two tables. The first describes the inputs and outputs used to create the XYZ butterfly position. The inputs are days to expiration, implied volatility, interest rate, and the price of XYZ. The outputs are the options that make up the butterfly along with their prices and the total cost incurred or credit received upon entry. The second table points out the key levels for this position (up break-even price, down break-even price, maximum dollar gain, maximum gain price, maximum dollar loss, maximum loss prices) and explains how these levels are calculated. For instance, in a long call butterfly the up break-even price is the high strike minus the cost of the spread. Rhoads compares particular butterfly constructions to other option spreads. For instance, a long call butterfly can be viewed as a combination of a bull call spread and a bear call spread. An iron butterfly can be described as a combination of a bull put spread and a bear call spread. Alternatively, it may be viewed as a “deviation of a short straddle” or as a short straddle with wings. Rhoads also details the advantages and disadvantages of the iron butterfly as opposed to the short straddle. As you can gather from this short description, Option Spread Trading is not a jazzy book. Nor will it appeal to the reader who wants a step-by-step instruction manual. But it is a solid introduction to the field. ANTs: Using Alternative and Non-Traditional Investments to Allocate Your Assets in an Uncertain World by Dr. Bob Froehlich (Wiley, 2011) is a survey of asset classes that can be used to diversify portfolios. They are by and large the usual suspects—commodities, currencies, real estate, infrastructure, TIPS, and collectibles. Floating rate securities, another suggestion, are not normally included in the standard lists, so let me spend a little time on them. The rationale for investing in floating rate securities is as a hedge against fixed rate securities during periods of rising interest rates. “When interest rates rise, all of your fixed income investments will decline in value. However, if you also have exposure to floating rate investments, they will increase in value and, depending upon your asset allocation to this asset class, could more than make up for what you lost in fixed rate investments.” (p. 93) Froehlich advises investing in a mutual fund that offers a mix of senior, secured, floating bonds. One of the strengths of this book is that it offers ways to invest in alternative assets that are accessible to the retail investor. Let’s say you would like to invest in art. Well, that could be a rather expensive (and potentially illiquid) proposition. But it turns out that there is a fund (the Sharpe Art Fund) that invests in worldwide art objects. Granted, it has a 2 and 20 structure and hasn’t exactly knocked the ball out of the park, but at least it has been profitable every year since it was launched in 2006. Froehlich does not recommend do-it-yourself investing. He is adamant that anyone looking to make alternative investments must have a financial advisor—and, of course, the right financial advisor. But whether the reader accepts or disregards his dictate, the material in this book provides the investor with valuable research tools. A footnote. I don’t make a practice of railing against book designers on this blog. After all, I worked hand in hand with book designers for many years, some of them among the very best, and I have great respect for the work they do. But in this case I feel compelled. Ants are everywhere in this book--part titles, chapter titles, chapter openings, and inserts. They vary in size, from tiny to a whopping 5 inches high on the chapter openings, thereby hopelessly distracting the reader from the text. Moreover, although I don’t have an ant phobia, I started to itch while reading the book. All in all, a bad design idea gone viral. In 2009 more than 87 million Americans were invested in mutual funds, but it is unlikely that more than a handful outside of the industry had any idea how these funds work. Robert Pozen and Theresa Hamacher set out to educate the investor in The Fund Industry: How Your Money Is Managed (Wiley, 2011). The education is thorough and the “course,” though no “sluts and nuts” gut, is nonetheless both clear and enjoyable. I highly recommend it. The 500+-page book is divided into five sections: an investor’s guide to mutual funds, mutual fund portfolio management, selling investment funds, operations and finance, and the internationalization of mutual funds. The book is chock full of information that I readily admit I was completely ignorant of. I debated what to share in this post and decided on the daily net asset value (NAV) calculation. This may seem an obscure topic, but after all it determines what an investor’s mutual fund holdings are worth on any given day. And it’s nowhere near as straightforward as I assumed. Each business day the fund’s accountant has until 5:50 p.m. ET to compute the fund’s NAV (referred to in the trade as striking the NAV) and transmit it to NASDAQ for dissemination the next day. Striking the NAV is the culmination of accounting activity that takes place over the course of the day. The fund accountant starts by projecting cash availability, then records portfolio trade activity and capital stock activity, processes corporate actions, records expense accruals (both 12b-1 and non-12b-1), and calculates and records distribution amounts. Once the NYSE closes at 4, each security in the fund’s portfolio (bonds as well as stocks) must be priced. Sounds relatively simple, doesn’t it? For U.S. stocks, it usually is: a stock’s value is the price of the last transaction reported on the consolidated tape. But other securities have different methods of valuation. For instance, most bonds are valued using matrix pricing; thinly-traded investments are sometimes priced at the average of the bid and the offer. Fund boards of directors may opt to close this time zone gap by using fair valuation, using U.S. futures contracts to adjust the price of its holdings. Take a U.S. fund heavily invested in Japanese stocks. A pricing committee may compare the 4 p.m. price of the U.S. Nikkei 225 futures contract to the value of the Nikkei at the close of the Tokyo Stock Exchange and adjust accordingly. I think most people will find The Fund Industry one of the most informative books they’ve read in quite a while. And that’s a shame. It shows that mutual fund investors know mighty little about where they’ve put their hard-earned money. While watching a movie I decided to transcribe a bibliography of investing books from the "finance library" list in Qatar Finance [QFinance]: The Ultimate Resource (Bloomsbury, 2009). Every list is idiosyncratic, but you might find something that you meant to read earlier and never got around to. I’m having a blast on my fantasy spring break. I even managed to get a second emergency delivery of 100 gallons of heating oil, so I have another two weeks for Mother Nature to accommodate. By the way, for those of you who don’t deal with the harsh reality of fuel oil prices, my oil company’s current retail price is $4.199 a gallon. I don’t pay retail, but this figure gives some indication of the cruel bite of commodity inflation. One of the books I have here for review is a highly unlikely candidate: The Crossley ID Guide, Eastern Birds. I read the blurb in the Princeton University Press catalogue and decided that traders might learn a lot from the way Crossley approaches bird identification. So while I continue my fantasy spring break, here’s a link to a short video about the book. 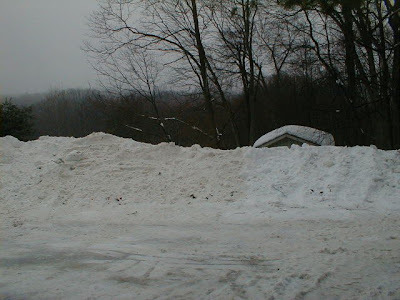 In the bleak midwinter with “snow on snow, snow on snow,” and even worse ice on snow, I think it’s time to pause, reassess, perhaps reinvent. Or maybe just vegg. Whatever the case, I’m going to take a mini-break from blogging. My mini-breaks tend to be nano-breaks, two days rather than two weeks. But for however long it lasts, call it my fantasy spring break. Admittedly, it takes a lot of imagination to go from struggling with the cruel Connecticut weather to lying on a warm, sunny beach. And, yes, to looking a lot younger and sexier. 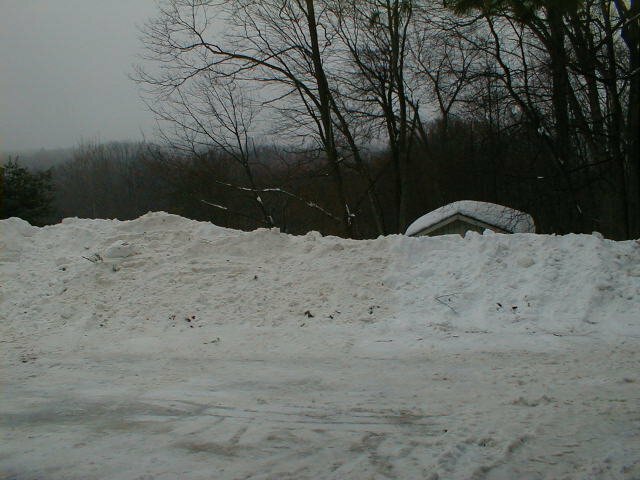 Here’s a shot of part of the snow on the flat area at the bottom of my driveway with the forlorn shed in the background; it took both a plow and a back hoe to amass this mountain. Despite the effort and the mounting cost, the driveway remains impassable to all but the most intrepid four-wheel-drive vehicles. 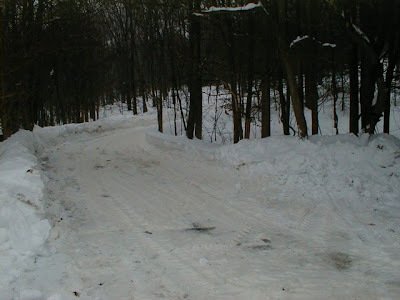 The man who plows the driveway had to tow the back hoe up the driveway, and it took an ample supply of sand for him to have enough traction to accomplish this task. There’s no way to photograph the full length of the driveway, but this is how it starts out. Trust me, it gets a lot worse. While I figure out how to re-energize myself, explore the archives. I’ve written over 500 posts, so with any luck you’ll find something of value to you. And fear not, I already have seven new books waiting to be read (one fished out of a snow bank this morning) and some more in transit. For your weekend listening pleasure, here's a link to WGBH's The Bach Hour, where the most recent episode features Glenn Gould's 1955 performance of the Goldberg Variations. Kirkpatrick & Dahlquist, Technical Analysis, 2d ed. Don’t yawn at the prospect of yet another book on technical analysis. This one is far superior to the usual fare. It is also, for those aspiring for credentials, the official companion to the Market Technicians Association CMT program. Technical Analysis: The Complete Resource for Financial Market Technicians, 2d ed. by Charles D. Kirkpatrick II and Julie Dahlquist (FT Press, 2011) is a hefty 700-page book. Thankfully it is not a compendium of technical indicators. Instead, in 23 chapters it covers such topics as the principle of TA (trend), sentiment, market strength, chart pattern analysis, trend confirmation, system design and testing, and money and risk management. These topics may be time-worn, but the authors approach them with a welcome conceptual freshness and illustrate many of them with data not readily available elsewhere. The result is a thorough but eminently readable book for those who are learning the art of technical analysis. For those steeped in TA, it provides an opportunity to step back and rethink some assumptions as well as to become acquainted with new metrics. Today I’ll share an oscillator for market timers and a method that system traders can use to place protective stops. Technical Analysis is a first-rate book that every trader and investor—even those who believe that TA is voodoo—should read. It is a skillful, comprehensive overview of the field. Having read Kurzban’s Why everyone (else) is a hypocrite, I am convinced that the left brain/right brain split is a gross oversimplification of the brain’s functional organization. Nonetheless, sometimes simplifications work well enough. For today’s post I’m going to share some thoughts from Robert Koppel’s 1996 book The Intuitive Trader: Developing Your Inner Trading Wisdom. It’s an extended argument for and a series of illustrations of using the right hemisphere to expand trading prowess. The bulk of the book is a series of interviews with traders and those who worked with traders, many of whom predate my active involvement in the markets. Among the cast of characters are Bill Williams, Richard McCall, Charles Faulkner, Edward Allan Toppel, Ellen Williams, Linda Leventhal, Howard Abell, Tom Belsanti, and Peter Mulmat. Here are a few disconnected excerpts that I thought worth passing along. It turns out that I could have saved myself a great deal of frustration had I read Ernest Sosa’s earlier books on epistemology. But Knowing Full Well (Princeton University Press, 2011), based in part on lectures he gave at Soochow University in Taipei in 2008, provides an overview of his theories. So it’s a perfectly reasonable place to start. I assume that Sosa doesn’t have a secret life hanging out on prop trading desks. And yet his epistemology seems almost curve-fitted to the trading environment. Today I’m not going to write my usual review but will instead look at some passages from the very beginning of the book to illustrate this point. In a future post (or posts) I’ll milk Sosa’s book for more trading/epistemology insights. An analogy to the performance of the hunter archer (hence Diana on the dust jacket) makes this thesis more comprehensible. Let me quote more extensively than usual. “A hunter archer’s shot selection and risk taking may be excellent, for example, and in taking a certain shot he may manifest his competence at assessing risk, while the shot itself nevertheless fails, being unsuccessful (inaccurate) and hence inapt. The shot is hence meta-apt without being apt. In summary, “A shot is apt iff the success it attains, its hitting the target, manifests the agent’s first-order competence, his skillful marksmanship. “A shot is meta-apt iff it is well-selected: i.e., iff it takes appropriate risk, and its doing so manifests the agent’s competence for target and shot selection. All I can say is, wow! Epistemologists have every reason to praise this book, but traders with a philosophical bent can do cartwheels.